The Pontic-Caspian steppe, extending from the Danube estuary to the Ural mountains, has played a crucial part in European and Asian history. This is where the horse was domesticated, chariots invented, and one of the earliest place where the Bronze Age flourished and from which it expanded. From approximately 4000 BCE steppe people moved westwards to establish themselves around the Danube valley and the Carpathian basin, then little by little deeper into Europe. Here is a summary of this long series of migrations that is thought to have brought Indo-European languages and culture to Europe and contributed significantly to the modern European gene pool. Nowadays, approximately two thirds of European men belong to the Y-chromosomal haplogroups R1a or R1b, two patrilineal lineages that have now been confirmed by ancient DNA tests to have arrived in Europe with the Indo-European migrations from the Pontic-Caspian Steppe during the Bronze Age. Yet, long after the Bronze Age ended, nomadic Steppe people frequently led more incursions into Europe. Not all of them were Indo-European speakers and, by the Late Bronze Age, even those that were, like the Scythians, had become admixed with a variety of non-Indo-European peoples from the Caucasus, Central Asia, Siberia or even the Middle East. 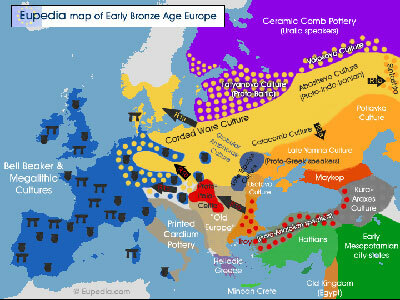 You can visualise here the maps of Bronze Age migrations into Europe. 4200-3900 BCE : Late Copper Age horse riders invade the old Balkanese tell settlements of eastern Romania and Bulgaria. Most of the towns and villages of the Gumelnita, Varna and Karanovo VI cultures are abandoned. A new hybrid culture emerge, the Suvorovo-Cernavodă culture (4000-3200 BCE), which will expand further south to the Aegean during the Ezero period (3300-2700 BCE). 3500 BCE : Other advances from the steppe into the Cucuteni-Tripolye culture lead to the formation of the hybrid Coţofeni culture, also known as Usatovo culture, in north-eastern Romania. 3200-2800 BCE : First north-west expansion of the Yamna culture from the western steppe to modern Poland, Germany, Scandinavia and Baltic countries. Creation of the Corded-Ware (or Single Grave, or Battle-Axe) culture (3200-1800 BCE). 2800-2500 BCE : Hybrid people from the Cotsofeni and Ezero cultures start moving up the Danube and settle in mass in the Hungarian plain. The southward expansion of the Abashevo, Poltakva and Catacomb cultures from the Volga-Ural to the Black Sea shores pushed more pastoralists of the late Yamna culture to Europe. 2500-2300 BCE : Indo-Europeans expand from the Hungarian plain to Austria, Bohemia, Moravia, southern Poland and southern Germany and start the most important Central European Bronze Age culture : Unetice (or Aunjetitz). 2300-2000 BCE : The Indo-Europeans continue their advance to Western and Northern Europe, spreading the Bronze Age and the single grave tradition with them. 2000-1100 BCE : The Sea Peoples invade the Aegean and Eastern Mediterranean from the north (probably from the Black Sea). This is one of the most controversial part of ancient history due to the lack of clear evidence about the origin of the Sea Peoples. The Indo-Europeans from the steppe or from Europe itself were the only warriors with sufficiently advanced weapons and knowledge of seafaring to have destroyed the powerful palace-states of Greece, Anatolia, the Levant and Egypt. It also fits the 1000-year interval otherwise lacking any major migration from the steppes, at the time when the eastern Indo-Europeans were conquering Pakistan and India from Central Asia. 800-550 BCE : The Cimmerians are ousted from the Pontic steppe by their cousins the Scythians coming from the Volga-Ural region and Central Asia. The Cimmerians settle in Anatolia and around modern Romania around 800 BCE. The Cimmerian culture commenced circa 1200 BCE. Some archaeologists place their origins in the North Caucasus. Some accounts have it that the Cimmerians moved to northern Germany and the Netherlands and became the ancestors of some Germanic tribes, like the Sicambri (ancestors of the Franks). The Scythians followed between 650 and 550 BCE in Transylvania, Hungary and southern Slovakia. They kept trade routes with the steppes until the Roman conquest of Pannonia and Dacia. 100-500 CE : The Huns from southern Siberia invade Eastern Europe, pushing the Alans (a Samartian-descended tribe) westward. The Goths, Vandals, Franks, Angles, Saxons, Jutes and others cross into the Roman Empire under pressure from the new steppe migrants, which caused the collapse of the Western Roman Empire. 550-1000 CE : The next invaders from the steppe were the Avars, who entered the lower Danube region in 562. The Avars established their dominion over the Danube basin, from central Romania to eastern Austria, from the late 6th to early 9th century. In the 4th century, some Bulgars had crossed the Caucasus into Armenia while others had already followed the Huns, then the Avars to Central Europe. The Pontic steppe and North Caucasus was ruled by the Bulgars during the Old Great Bulgaria period in the 7th century. Under pressure from the Khazars, the Bulgars split in two groups; one migrating north to Volga Bulgaria, and the other to the Carpathians founding the First Bulgarian Empire (680–1018 CE) around modern Romania and Bulgaria. The Magyars and Khazars migrated from the Ural-Volga region to modern Ukraine around 830, raided their way across the Carpathians as far as Bavaria, where they were stopped in 956, then established themselves permanently in Hungary in the 10th century and founding the Kingdom of Hungary in 1001. 1235-1300 CE : The Mongol Empire reached Europe around 1235 and the Mongols invaded relentlessly Bulgaria, Poland, Bohemia, Hungary, Austria, Croatia, Serbia and Byzantine Thrace. They were eventually defeated and expelled from Europe, but may have left some genetic traces (although very minor ones based on current evidence). 1350-1550 CE : The last people from Central Asia to come to Europe were the Turks, who conquered the Balkans from 1359 to 1481, then the Carpathians and Hungary from 1520 to 1566. They were not technically from the Pontic-Caspian steppe, but from areas of Central Asia settled over 4000 years ago by the Indo-Europeans from the Volga-Ural steppe. Like other Turkic peoples (Huns, Avars, Bulgars, Khazars, Tatars) the Turks supposedly brought a lot of R1a lineages with them (+ a little R1b). The continuous flow of steppe people had a cumulative effect on the European gene pool. Nevertheless, it was the early migrations of the Copper and Bronze Ages that had the biggest genetic impact. Prior to 4000 BCE, there seemed to be no trace of haplogroup R1b-L23 (and subclades) in Europe outside of the Pontic-Caspian Steppe. Older branches of R1b were found Mesolithic samples from the Balkans and the eastern Baltic, but they are now for the most part extinct. The R1b branch of the Indo-Europeans is linked to the expansion to the Carpathians and Balkans (Usatovo-Coţofeni, Ezero, Otomani cultures), then the expansion to central Europe, spreading along the pre-existing Bell Beaker trade networks as far west as Britain and Ireland. The same is true for haplogroup R1a. Old branches that left few or no modern descendants were identified in Mesolithic remains from eastern Europe, but the R1a-M417 branch that survived and replaced all others probably originated in the Yamna culture, and ancient DNA tests confirmed that it was propagated mostly through the Corded Ware culture. Nowadays over half of modern European men now carry a Y chromosome descending from the R1a or R1b variety found in the Steppe during the Early Bronze Age, R1b being predominant in Western Europe, while R1a is more common in Central and Eastern Europe. Another paternal lineage found in the Yamna culture that seem to have spread with the Indo-European migrations is I2a2a-L701. Haplogroup I2 was the main lineage of Mesolithic Europeans and was found throughout the continent. I2a2a-L701 appears to be a branch found in Mesolithic Ukraine and southern Russia that became part of the Yamna culture. It is also likely that some paternal lineages of the Neolithic cultures adjacent to the Pontic Steppe were partly absorbed by the Steppe invaders and propagated with them to the rest of Europe. That could have been the case of the Cucuteni-Trypillian culture, located around modern Moldova and western Ukraine, which was adjacent to the Yamna culture in 3500 BCE. A prime candidate is haplogroup G2a, the main lineage of Neolithic farmers. The G2a-U1 subclade was confirmed by ancient DNA to have been a lineage of the Cucuteni culture. Its dispersal pattern and the age of its clades strongly suggest a Bronze Age diffusion during the Indo-European migrations to central and western Europe. That is also probably the case of G2a-Z1816, which seems to have spread alongside the Proto-Italo-Celtic branch R1b-U152. These Proto-Indo-European migrations in the Bronze Age had a bigger impact on the paternal side (Y chromosome) because men can procreate with several women and polygamy was common in hierarchical Bronze Age societies. But steppe women also accompanied them. They would have diffused mitochondrial haplogroups H2a1, H6, H7, H8, H15, K1c, K2b, U2d, U2e, U4, U5a1a, I1, I2, I3, V7a, V15 and W around Europe. Migrations from the Pontic Steppe during Middle and Late Bronze Age would have brought a blend of R1a, R1b and other new lineages like J2b2a-L283, which was found in a Proto-Illyrian site in Croatia dated c. 1600 BCE. It seems that E-V13 was another Neolithic European lineage that was assimilated by the Indo-European newcomers. Its main clade CTS5856 has a coalescence age of only 4100 years, which places its expansion during the Middle to Late Bronze Age. The last presumably R1b people to leave the Steppe were the Cimmerians. The Sarmatians who expelled them seem to have assimilated some of the local Steppe people who didn't flee. One early Sarmatian individual belonged to R1b-Z2103 (like Yamna). However it is likely that the Sarmatians predominantly belonged to R1a like other Iranian tribes. Two late Sarmatian or early Alanic samples (300-400 CE) from the Republic of North Ossetia–Alania belonged to haplogroups R1a,G2a and J1. The latter two are common lineages in the North Caucasus and can both exceed 50% of the population in some ethnic groups. Therefore they are most probably assimilated local lineages rather than original Sarmatian/Alanic lineages. All subsequent migrations from the Steppe would have brought primarily haplogroup R1a to the Balkans and central Europe. South-East Europe now has the highest R1a diversity due to the numerous Eurasian tribes who settled there dor nearly two millennia, between 800 BCE and 1000 CE. Dozens of ancient DNA samples Scythian remains were tested for mtDNA and a few also for Y-DNA. Eleven Scythian or Scythian-related Y-DNA samples were tested from various places in Russia and Siberia, and all but one belonged to haplogroup R1a (the last one belonged to the Siberian haplogroup N). Only two were tested for deep clades and both fell under the Indo-Iranian Z93 branch (unsurprisingly since the Scythians were an Iranian tribe). It is likely that the Scythians also carried a minority of haplogroups R1b-Z2103 (like other Indo-Iranian people), but also J2a and Q1b from Central Asia, where they originated. Their mitochondrial haplogroups show that the Scythians from Russia were heavily admixed with Mongoloid/Siberian tribes on the maternal side. The Huns originally came from Mongolia and the Altai. Many 2000 year-old samples were tested for both Y-DNA and mtDNA and they do not appear to differ much from present-day Mongols. Their main Y-DNA lineages were C2a, N1 and Q1a, but they also possessed some R1a and R1b (and equivalent Proto-Indo-European mtDNA lineages like H, J1, U2e and U5a). By the time the Huns reached Europe, they had become a confederacy of several tribes incorporated into the Eurasian Steppe, and many of them were in all likelihood R1a dominant (because descended from the Sarmatians and Scythians). This explains why very few East Asian lineages are found in parts of in Europe where the Huns settled, notably in Hungary, the Carpathians, Poland and Germany. These are all regions with considerable levels of R1a, and some of it could have been brought by the Hunnic confederacy from the steppe. The Avars, Bulgars, Magyars, Khazars would also have brought mostly R1a lineages, probably with some other typical Iranian (G2a, J2a, R1b-Z2103), Turkic (C2a, Q1a) and even Uralic lineages (N1c). Six Magyar Y-DNA samples from the 10th century were tested and they belonged to haplogroups I2a (x2), N1c (x2) and R1b (x2). The Y-DNA of King Béla III of Hungary was tested by Olasz et al. (2018) and turned out to be R1a. Béla was a member of the Árpád dynasty, which ruled over Hungary from the arrival of the Magyars in the 9th century until 1301. The Turks descended from the Altai to Central Asia and conquered the Byzantine Empire. The original Turkish invaders left a significant genetic imprint on the Anatolian population. Nowadays 7% of Turkish men carry a Y chromosome that originated in Mongolia or Siberia (haplogroups C, N, O and Q). Another 7% belongs to haplogroup R1a (chiefly the Z93 branch), most of which might have come with the Turks as well. Descendants of the Ottoman dynasty tested positive for R1a-Z93. 500 years of Ottoman rule in the Balkans have left a small but noticeable percentage of Turkish Y-DNA in the region.